The Avengers Age of Ultron is jam packed with Easter Eggs and after watching it twice I still don't feel like I have caught everything. This post will likely grow over time as I see more. First lets talk about Thor. Thor's nightmare created by the Scarlet Witch is of him speaking to Heimdale in Hel. Heimdale blames Thor for bring about the destruction of Asgard. Thor also has a vision in which he sees the 6 infinity stones/gems that seem to be origins of the destruction that has befallen Asgard. Thor then seeks a pool in a cave that he calls the "Waters of Sight". Selvig warns that nothing good has happened to any man who has entered the pool. Thor says the pool will allow him to recreate his vision but with more clarity. When Thor enters the pool the vision repeats and it hovers longer over the the 6 stones. Thor then reappears where he forcefully finishes the creation of the Vision. He claims it is necessary for the Vision to be created to stave off the coming calamity. Vision is shown being capable of using Thor's hammer. To Thor this is a sign that the Vision is worthy of keeping the mind infinity stone. These happen very quickly and I personally felt like there was likely more scenes here. I would not surprised if there is more material about Thor's vision in the Extended version. The death of the Asgardians - This is a clear tie to the upcoming Thor film, Thor: Ragnarok. In both Norse Mythology and the comics Ragnarok is part of cycle where all the Norse gods die. In some versions they are reborn afterward. The Six Infinity Stones - This directly ties to the 6 infinity stones that Thanos is seeking to bring together and will kick off the story in Avengers Infinity War. Based off of Thor's vision it also seems like the stones may some how kick off the Ragnarok story line. In the comic stories Thanos had nothing to do with Ragnarok so it will be interesting if the story of the film is different. I do not know of any well like this is the comics however there is a well in Norse mythology called Urðarbrunnr that sits at the roots of the world tree. This well is used as a meeting spot of the gods and can be used to see visions. The Waters of Sight were initially planned to be the well of Fate that is guarded by the Norns. However, the Norns were cut from the film and this section made shorter. There were some huge Black Panther tie ins. Ulysess Klaw appears in a scene where Ultron comes to negotiate / take Klaw's stockpile of Vibranium. During this sequence Klaw has his arm ripped off by Ultron. It is also revealed that Klaw had prior dealing with Tony Stark and that he is branded. The brand on his kneck is Wakandan for Thief. Klaw is the primary villain of the Black Panther. He is constantly going to the nation of the Black Panther called Wakanda to try to take control or steal the country's major resource, Vibranium. He replaces his arm in the comics with a Vibranium Sound cannon like weapon. If you were worried about him in the film don't worry his arm will come back as something much worse. Hulk and Iron Man have a massive destructive battle in a city in Africa. This huge slugfest that is occurring within Africa is something that T'Challa (AKA the Black Panther) would not only notice but also be something that he would be royally peeved with. No one likes when a house guest shows up and starts wrecking stuff and that's basically what the Avengers were doing. Keep in mind it was two Avengers doing the wrecking in that city. Another thing that T'Challa will not like is that Ulysess Klaw was left as a billionaire by Ultron. A normal criminal may leave and go away but Klaw is obsessed with Vibranium and will likely turn use this money to become an even worse thorn in his side. Wakanda is also mentioned numerous times each time a not so subtle Black Panther easter egg. It should also be noted that in Agents of SHIELD General Talbot mentions an operation called "Panther Klaw" presumably this operation had some some tie between Ulysess Klaw, Wakanda and the US Military. It could be that the US Military was seeking its own supply of Vibranium through Ulysess Klaw. It could be through this operation that Klaw came into the possession of the Vibranium and his Wakandan brand of Thief on his neck. At the end of Avengers Age of Ultron, Vision swoops in and rescues Wanda. This was not a simple coincidence but was a meaningful wink. The Vision and Scarlet Witch in the comics were an item and even married with Children at one point. This dramatic rescue could be the moment where Wanda falls in love with the Vision in the MCU. The marriage between the two dissolves in a West Coast Avengers story where Vision is dissembled. 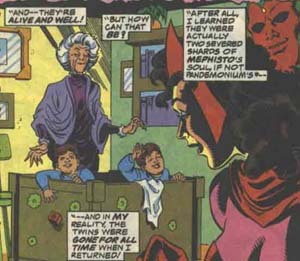 Their children also disappear when they are revealed to be magical constructs combined with soul pieces from Mephisto. The kids have since reappeared as the heroes Wiccan and Speed. At the time many people felt Wanda's relationship with the Vision to be pretty weird. Personally, I always kind of liked it. To me it showed that Wanda could see past all of the elements of the Vision and see his heart. It also said to me that the Vision was a man or an entity on equal footing as a man that had gone past the definition of being a thing or simple robot. Also how could you not be in awe of the Vision as he appeared in Age of Ultron, holy crap he is amazing. Cap vs Iron Man - There were a lot of scenes in the film that seemed to directly relate to Captain America: Civil War. First, there is a general disagreement that pervades the scenes with Tony Stark and Captain America. Captain America strongly disagrees with Tony Stark's creation of Ultron. As Stark begins to explain his plan of making the Avengers obsolete, Captain America interjects that many have tried to stop a fight before it starts, and it always ends badly. All of these arguments see to help set the stage for the two heroes to go toe to toe in Captain America Civil War. The stage was further for Stark to be something of a bad guy. The Scarlet Witch saw that in Stark's mind he had the seeds for the Avengers doom. Pretty dark stuff. Granted in the end it seemed as though Stark's attempt to finish the Vision was actually a good move. Falcon / Bucky - A couple of other items, the Falcon appears twice in the film. At the party he mentions searching for Bucky to Steve. This is an item that will surely be followed up on in Captain America 3. In the end of the film Falcon reappears as one of the new Avengers. Death of Strucker - Baron Von Strucker is shown to have been killed. This likely leads for Helmut Zemo to taking the reigns of Hydra. Keep in mind that Helmut has masqueraded before as a hero and if Hydra is in shambles he may do that here. Stark = Hank Pym - One interesting thing that I noticed is that Iron Man leaving the Avengers felt a bit like Hank Pym leaving the Avengers. The guilt of creating Ultron really got to Hank Pym and it seems that Tony Stark could be suffering for the same reason. Even though the good guys won a ton of destruction was caused by Stark's creation and that guilt may be getting to him. When Stark is selecting a new operating system for the Iron Man suit he chooses one called FRIDAY. However there is another operating system in the back labeled Jacosta. In the comics Jacosta is another AI created by Ultron to serve as a kind of mate/ female countpart. Ultron uses the brain patterns of the Wasp ie Janet Van Dyne (Hank Pym's wife) as the model for Jacosta. As Ultron in the comics is based off of Hank Pym's brain waves it made sense for him to base his counterpart's mind off his own creator's wife. While logical it fails miserable and Jacosta completely rejects poor ol' Ultron. Thanos reaches into a vault for a Gauntlet devoid of any Infinity Gems. It is a left handed Gauntlet and different from the right handed one that appears in the treasury vault of Asgard in Thor. He then remarks that he needs to do it himself. This indicated that Thanos was planning on the mind gem to destroy Earth. He seemed to predict humans creating something like Ultron from it. He now is going to destroying himself. This of course will kick off the two part mega event of Avengers Infinity War. Is one of the Gauntlets fake? Kevin Feige reveals that there are two Guantlets. More was revealed potentially accidentally at a press conference promoting Age of Ultron where. Jeremy Latcham remarked "Which one do you think is the real one?" Jeremy apparently caught an angry glance from Feige for making this comment. This may mean that one of the Gauntlets is a forgery. If its Thanos's Gauntlet then Odin replaced the real one to give Thanos a false sense of confidence. If its the Asgardian one then perhaps Loki stole the real one, provided it to Thanos then replaced it with a replica. This could indicate that Loki had been working with Thanos for sometime prior to the event of Thor 1. Tony's dream of all of the Avengers dead combined with Captain America's broken Shield could actually be a prophesy for the future. Thanos is famous for breaking Captain America's shield and killing almost everyone off. Another hint that this could be more than a dream is that it appears that Nebula is in the background of this sequence. You might remember Nebula as the bald blue headed villain in Guardians of the Galaxy. Nebula is highly connected to Thanos and to the Infinity War story. In one part of the story she even wrests control of the Gauntlet from her father. However, Tony Stark has no idea who Nebula is. How could he dream about her? Perhaps, Scarlet Witch is actually tapping into something more profound than dreams. Keep in mind that if someone else gets hold of the Gauntlet they can bring everyone back to life. Here are some of the famous Infinity War panels depicting these events. Review: Avengers Age of Ultron is better than Donuts! What does Avengers Age of Ultron Mid Credit Scene mean? All three Avengers Age of Ultron TV spots! Who is the mystery girl standing behind Thor? The Black Panther to make first MCU appearance in Age of Ultron? Who has been cast as the Black Panther? Monday Marvel News - Asgardians appearing in Age of Ultron? Avengers Age of Ultron crushes early sale expectations! Video: Real Science of the Avengers explored! The 2nd Avengers Team - Here comes Cap! Caption this picture Challenge - Enter Tigra! Who is Ms Marvel/ Carol Danvers? Who is Beta Ray Bill? The Villains of Age of Ultron have arrived! Scarlet Witch a villain or hero? Quicksilver a villain or hero? Who is Klaw? Why is he so important to the Black Panther Mythos? Avengers: Age of Ultron Legos spotting on Target shelves! West Coast Avengers - Assemble! West Coast Avengers - Girl Power! Black Panther appearing in Avengers Age of Ultron!! !